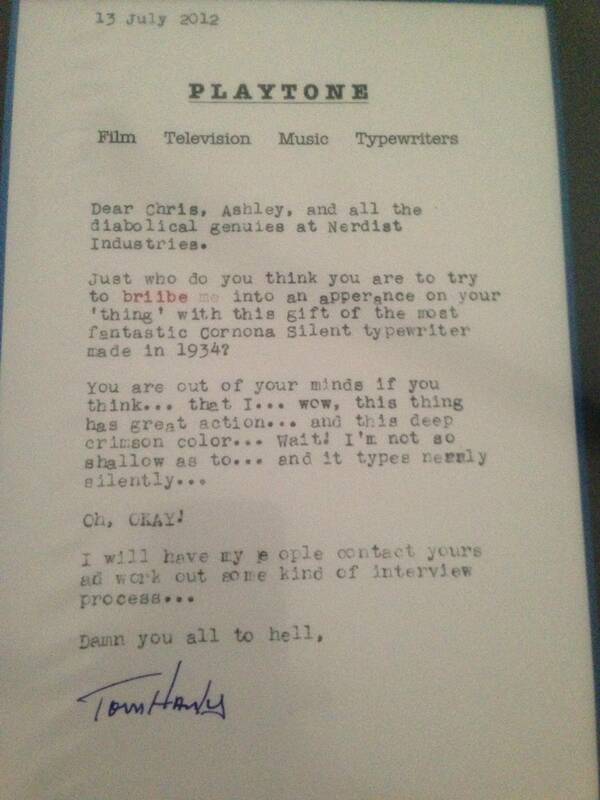 Man Sends Tom Hanks a 1934 Smith Corona Typewriter with a Typed Invitation. Read Tom’s Response. For those who may not know….Tom Hanks loves typewriters. He owns several hundred and has them displayed all across Playtone (his production office). They are all in pristine condition and don’t look like they’ve aged a day. His entire production office is filled up with fantastic memorabilia. Lots of pop culture and incredible pieces from the forties, fifties, and sixties. Mr Hanks is a man loaded with taste, kindness and class! I absolutely love Tom Hanks! He is a true class act. I have often compared him to another great — Jimmy Stewart but I read a long time ago in some interview he gave that he actually doesn’t like that comparison. So I rescind saying that comparison publicly but will keep that high-regard of him to myself instead. what a funny reply, this man has writing skills too!